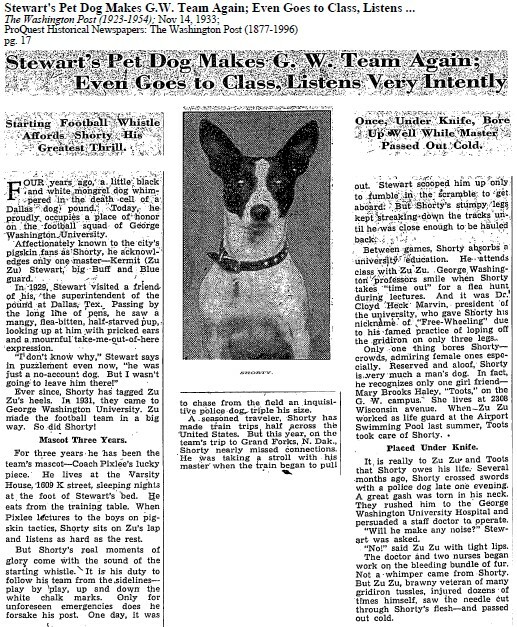 In 1929 a young man named Kermit Stewart adopted Shorty, a “black and white mongrel dog,” from the Dallas, Texas animal control shelter. In 1931 they moved to Washington, DC, so Stewart could play football for George Washington University. Shorty spent three years as the football team’s mascot, and the Coach referred to him as his “lucky piece.” Stewart and Shorty lived together in the Varsity House, located at 1609 K Street. Shorty ate dinner with the football team at the training table. He also traveled with the team, by train, for away games, traveling as far as North Dakota. Back on campus, Shorty went to class with Stewart and was well liked by professors. Three cheers for shelter “mongrels!” Click here for a PDF of the article.